The presence of ants in any homestead is one of the biggest worries anyone would have. Apart from the irritation that the ants come with, they are also responsible for negative health effects as a result of their bites on human skin. Do you have ants in your home and can’t figure out how to avoid them? This article is going to share and discuss five steps that you can take to ensure your home is completely free from the presence of these irritating insects. Let’s go right in and find out. The best solution to eliminating anything is to deal with the source. To do this, you’ll need to get a better understanding of the ants and where they are coming from. Ants are all products of the Queen ant. The Queen ant is responsible for laying all the eggs which will hatch into more ants. It is common knowledge, therefore, that killing the Queen ant will be the only solution to eliminating the entire ant colony. From a keen observation, one will realize that the ants we mostly encounter are worker ants and not the Queen ant itself. The Queen ant stays in its nest and does not leave. Knowing the location of its nest should be the first step towards dealing with the ant menace in your home. To get the source of the ants, you’ll need to observe them keenly. When an ant comes into your home, it obviously comes to seek for food. When it finds food, it will take the food to their nest. The ant will leave a scent to the trail it follows back to its nest. This serves as a way of directing other ants to where they can find food. By observing the ants for a while, you’ll be able to know where their nest is and, in effect, where the Queen ant is located. 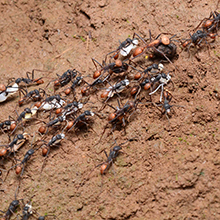 It is important to note that killing the trailing ants before establishing their source will be of no benefit at all. This is because the ants are just workers and the Queen ant will produce others if you kill the ones that come to your home. It is these worker ants that will lead you to the Queen ant and should, therefore, not be killed. Having established where the worker ants take their food, you’ll need to use them to eliminate the Queen ant by applying insecticide to the food that the worker ants come for. The ants will come, take the poisoned food and bring it to the Queen ant. This way, instead of killing the worker ants, you’ll be using them to kill the Queen ant, which is their source, thereby killing the entire ant colony. However, setting bait on specific areas should not lead you to clean other sources of food. This is because cleaning other food sources may result in the destruction of the ants trail. Loss of the ant trail will mislead other ants and the Queen ant will never get the poisoned food. This way, the Queen ant will continue producing more worker ants which means the ant menace in your home will not have been solved. The fact that the first food bait you set has been taken by the worker ants does not necessarily permit you to kill the ants. The reason for this is that it may take several days, weeks or months before the Queen ant is completely eliminated. Some species of ants, for example, have many Queen ants that produce them. In this case, you’ll need to set bait several times before all Queen ants are killed. In addition, spraying the ants with an insecticide should take place at the opportune time. After observing the worker ants for some time, you’ll establish their trail. It is only after you’ve followed the trail and established their outdoor nest that you should spray the nest with a powerful insecticide. Spraying the worker ants before leading you to their nest will not solve anything as their source will still be present. The above steps are not a necessity if you manage to keep the ants away from your home. An untidy home creates a perfect environment for ants to thrive. Just like other living creatures, ants need water and food for survival. They already have a shelter at their nest, and will come to your home for food and water. By making it hard for them to access these, you’ll have avoided their many visits to your home. To do this, you’ll need to seal all your food as well as keep all surfaces clean. There are also certain areas in your home that serve as entry points for these insects. This includes wall cracks, doors and windows. By sealing these areas well, the insects will not have a way of entering your home. From reading this article, one important thing you should note is that the Queen ant is only responsible for producing more ants. For this reason, the Queen ant does not leave her nest and feeds on the food brought by the worker ants. Killing the worker ants would be of little effect as the Queen ant will still be alive and would produce more worker ants. It is for this reason that the most effective way of eliminating the presence of ants in your home is to kill their source, the Queen ant. It is only the worker ants that will lead you to the Queen ant and help you kill it. Following the above steps will greatly help you in dealing with the ants in your home by either reducing the number of visits to your home or by completely eliminating their presence.